Kelly Lovell, Youth Mobilizer & Entrepreneur holding the G20 YEA Magazine where her whitepaper "The Digital Revolution: Dynamic Talent Tracking as the Future of Business" is published. 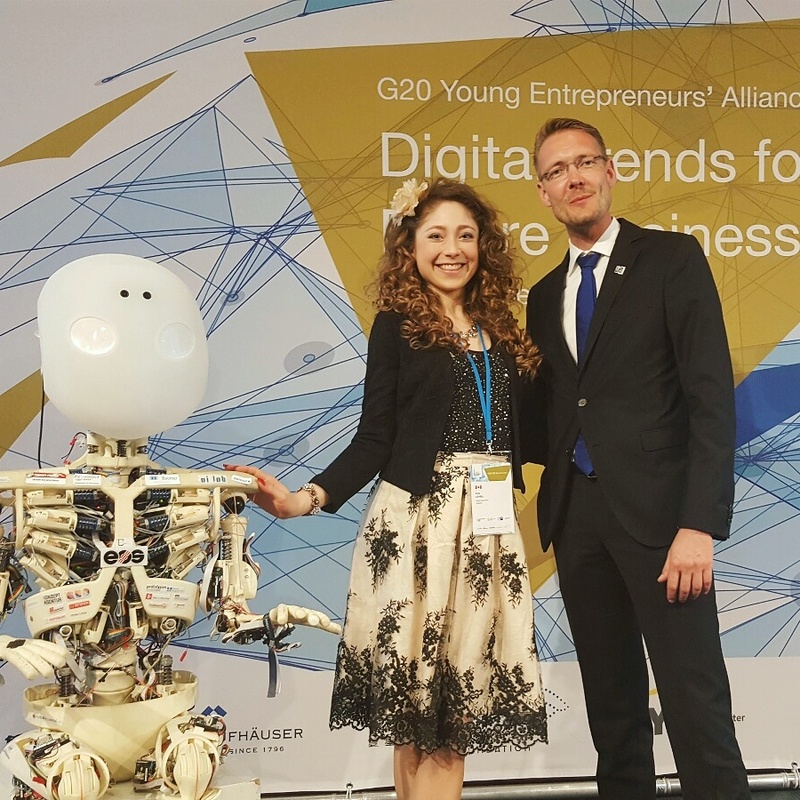 This past month I attended the G20 Young Entrepreneurs' Alliance Summit in Berlin, Germany. The mission of G20 YEA is to enhance the entrepreneur ecosystem, empowering youth to grow sustainable businesses that create jobs and transform economies. My role as a delegate was to represent the interests of young entrepreneurs and engage in high level discussions with world leaders aimed at building policy recommendations focusing on innovation and entrepreneurial education to address job creation and youth unemployment. In response to a lack of future opportunities and job prospects, many young people are turning to entrepreneurship as an alternative path. It is estimated that 54% of Millennials have either started a business or want to start a business in the future. 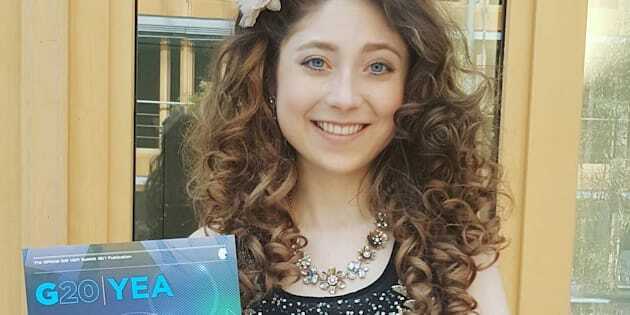 Rather than looking for traditional employment opportunities, however, many young people are establishing corporate contacts and using them to kickstart their entrepreneurial journeys. Founded under the pretense of global cooperation amongst entrepreneurs, the goal of the G20 YEA summit is to develop a communiqué with three priority recommendations for G20 governments aimed at understanding the importance of youth-led entrepreneurship and improving future outlooks for all entrepreneurs. The theme of this year's summit was Digital Trends for Future Business, with conversations emphasizing the challenges and opportunities offered by digital platforms, IoT, AI/VR and big data. At the end of the summit, delegates voted on our top policy recommendations to be passed on for the upcoming G20 meeting. To combat migration difficulties, the G20 YEA believes that a simplification of the migration process for young entrepreneurs could significantly motivate them to grow their businesses internationally and promote the free flow of innovative talent across borders. To make this flow of ideas possible, the G20 YEA recommends that the 20 countries establish a G20 Entrepreneur Visa Program to provide short-term, multi-entry visas and administrative simplification for young entrepreneurs by 2020. In our increasingly digital world, a global approach to entrepreneurship is becoming a defining feature of some of the world's most successful entrepreneurial endeavours. Much like Canada's own Start-Up Visa program, a short-term, multi-entry visa would encourage young entrepreneurs to make their ideas global and push all entrepreneurs to dedicate their endeavours to innovation and sustainability. In working with many young entrepreneurs, I have found that going global tends to be more of a forethought than a startup strategy. Even in my own ventures, I have found myself falling into the misguided impression that international sales is a later stage consideration. Due to the diversity of cultures and economic circumstances in different parts of the world, however, international markets offer more opportunities for entrepreneurs to find early adopters. Why should an entrepreneur struggle to find product-market fits in their local region if the problem they are solving is more pressing and the demand is higher in an international market? Though going global may not always be the first idea for young entrepreneurs, it is becoming increasingly apparent that this is the direction many should consider to get market traction and reach profitability faster. Through programs that encourage the free movement of innovation and technology, going global would be much easier and potentially help reduce struggles for market validation. The G20 Entrepreneur VISA would be a significant step forward in advancing this mission. While taxes vary between G20 countries, the financial and administrative burden they impose on businesses can curb growth for early-stage ventures and small-medium sized enterprises (SMEs). In North America, SMEs dominate the business market, representing 99.8% of all business in Canada and 99.7% in America. Coupled with investment and funding difficulties, tax regulations in the G20 nations disproportionately affects SMEs, making it virtually impossible for smaller businesses to scale. Much like Canada, most startups in the EU consider taxation to be the most burdensome policy that affects them. Without a strong cashflow, taxation can easily cripple early stage startups, making it overwhelming to young entrepreneurs in the early stages of their endeavours. In response to these difficulties, the G20 YEA believes that tax incentives for scale-ups and progressive policy measures would allow SMEs to scale. An example of these policy measures is a separate tax category for young entrepreneurs working in priority areas of innovation and social entrepreneurship. In keeping with the theme of international cooperation, the G20 YEA also encourages the harmonization of taxation schemes across the G20 nations to lower barrier for doing business across borders. Alleviating some of these tax burdens would allow young entrepreneurs to gain a solid footing without having to sacrifice money that they don't have. A strong, unified entrepreneur community starts with a quality education. As such, the G20 YEA believes that the G20 nations must review educational priorities to ensure that young people have access to the knowledge and skillsets that are vital to today's technological and business realities. These skillsets include, among others, digital competencies, STEM education, and venture creation skills. At the same time, it is recommended that education system be streamlined to reduce the fragmentation of knowledge in academic disciplines and emphasize ethical competency. In other words, young people should be encouraged to develop business skills and entrepreneurial thinking regardless of their field of study. Despite a growing international interest in entrepreneurial endeavours, most education systems still refute the importance of an education that values entrepreneurship, creativity, and innovation. Business skills, more than ever, are essential tools for the future generation of young professionals. With skyrocketing student loan debt rates, competence in financial planning and budgeting is not just beneficial for those pursuing a career in accounting. In a similar vein, it is near impossible for young professionals to stand out in the competitive job market if they can't problem solve or adequately market themselves in their interviews. Multidisciplinary education is therefore vital to ensuring the success of future young professionals.